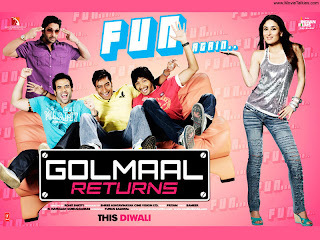 Get ready for another laughter dose by the makers of Golmaal with its sequel “Golmaal Returns” this October. This much-awaited follow-up of the comic hit movie of 2006, Golmal has already soaring in the top music chartbusters, thanks to the music composed by Vishal, Shekhar, Pritam and Ashiesh Pandit. Directed by Rohit Shetty, “Golmaal Returns” has been scripted by Rumi Jaffrey. This time you will see not just one heroine but four heroines competing with the heroes in their comic acts, so you can yourself guess how comic this sequel of Golmaal will be. The only thing missing in “Golmaal Returns” would be the presence of Sharman Mukherjee, who has been gracefully replaced by Shreyas Talpade. In “Golmaal Returns” you will see Ajay Devgan married to Kareena Kapoor, who has a dumb brother played by Tusshar Kapoor, who is in love with Celina Jaitley. See this comic bollywood movie with the best of comedy played by Amrita Arora, who plays the role of Ajay’s sister and actors like Arshad Warsi, who plays the role of an Investigating Officer. This is very much good.. I watched this film with my complete family and seriously we laughed enough at the time of film..